Bought this as a gift. Works well and was a very good price. Had for a couple of years. Still works great! I picked up this charger after having battery issue on the road. Mostly have kept around and used to charge electronic devices on trips. This last winter someone asked me to jump them, pulled this little guy out and with alot of skeptical looks, started their car in the blink of an eye. I've had to it for about 1 1/2 years. You have to keep it charged though and recharge it again right away after using it. 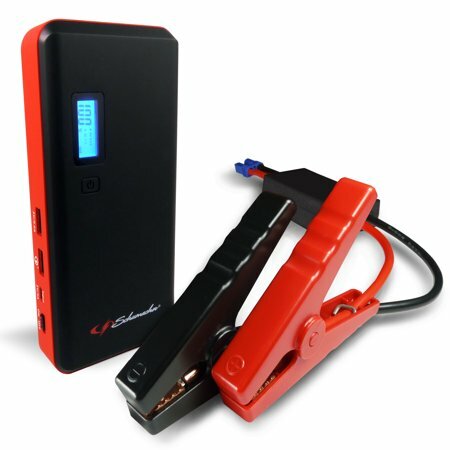 A great portable, rechargeable way to jump start a dead car battery. A full charge will give about 4 starts. You can also charge a cellphone or run a laptop. Learning curve to using it, but it does work. At first I was going to return it, but through trial and error got it to work. It has a hard time with very low charge (dead) batteries in cold weather. When the battery is very low, I've had success with (1) attaching the red(+)/black(-) clamps straight to the respective terminals of the battery, (2) pressing the power button until the green LED lights up, (3) then waiting 2-5 minutes with it connected to the battery. I look for a drop in power level percentage on the jumper display (5% drop or so). Once that happens, I haven't had an issue getting a battery to jump. I haven't had any success when attaching the black (-) to the car body/engine block yet. Bought mine July 2018. Checked the Charge from time to time. Showed 100%. Tried the LED light today. Only ran for a minute at most. Charge now shows 51%. Put it back on charge again. 20 minutes late at 55%. Got it so I could carry it on my motorcycle. Not sure now If I want to risk carrying it?